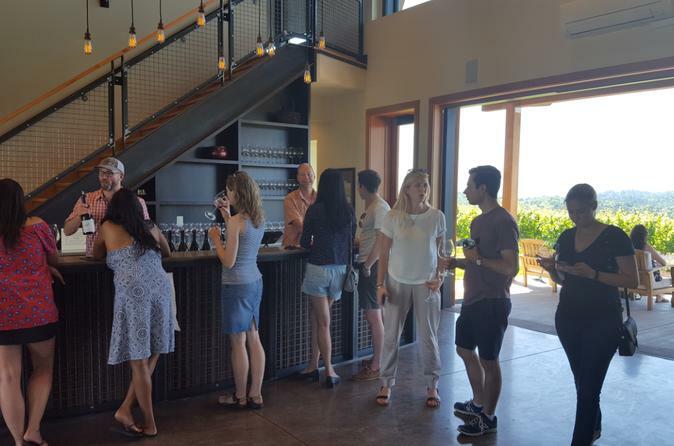 Join an all day Willamette Valley Wine Tour, and get a taste of the most decadent wines the lush Willamette Valley has to offer. Whether you are a wine tasting veteran or a newcomer, there is something for you. The guides are expertly trained in the ways of the Willamette Valley and its many vineyards, and they will usher you to 3-4 separate wineries over 7.5 hours, where you will have the opportunities to taste the famous Pinot Noir, Pinot Gris, Riesling, and other varieties that are well-known throughout the region. Join an all day Willamette Valley Wine Tour, and get a taste of the most decadent wines the lush Willamette Valley has to offer. Whether you are a wine tasting veteran or a newcomer, there is something for you. The guides are expertly trained in the ways of the Willamette Valley and its many vineyards, and they will usher you to 3-4 separate vineyards over 7.5 hours, where you will have the opportunities to taste the famous pinots, chardonnays, rieslings, and other varieties that are well-known throughout the region. The Willamette Valley is so well populated with quality wineries that it can be overwhelming for some to choose exactly which ones to visit. Let experts guide your way from winery to winery, as they fill you in on the dense and intriguing history of the Willamette Valley wine scene. This tour is perfect for an all-around wine lover, someone new to the wine scene, or anyone in-between. No matter how much exposure you've had to the world of wine, you are sure to end this tour much more knowledgeable on the subject of the beverage humans have been sipping for centuries. Join an intimate and personal wine experience in the lush Willamette Valley. Book your Willamette Valley Wine Tour today! Special Offer - Book and travel by April 30th and save 6% off our previously offered price! - Book Now!